Au Delà - Narcisse des Montagnes is a limited edition "flanker" of sorts to the perfume Au Delà by San Francisco-based visual artists and perfumer Bruno Fazzolari. In addition to the perfume, Bruno created numbered, limited edition silkscreen prints of narcissus flowers that accompany the first 50 bottles sold. While online the print looks beautiful, when I unwrapped the poster-tube, it took my breath away. What is it about all things handmade? Perhaps the intimacy, knowing that human hands have created an object. Perhaps the design itself. This kind of quality is inimitable. It's something that is felt beyond the technical terms and defies explanation. And that precise quality is also felt in a perfume that was created in that fashion. There is no substitute to that, even if the formula is followed to a T, and even if the exact same colour swatches are reproduced. Not only is it not going to look the same. It is not going to feel the same if it's produced in any other way. Not only is the media the message; also the method is the message. Even the box for the perfume is hand-collaged with striped black and white paper. Again, the kind of thing you might not be able to really see online or even from the shelf. But once you touch it, it's an unmistakable quality - texture, and the minute visual details that give off that human warmth to an inanimate object. The perfume itself opens with heart-aching green notes of narcissus, iris and galbanum, and resembles the great No. 19 by Chanel. It unfolds as an entirely different flower though: if No. 19 is a cold and angular steel flower, Au Delà - Narcisse des Montagnes is a velvet flower with round, plush petals. And it only becomes more warm and round as it wears on the skin. Sweet, cedarwood-like violet unfolds and gives the perfume a voluptuous body and presence. And from it emerges a sunny, shimmering amber, like the glittering light upon the sea at sunset. The amber is very much the same as in the original Au Delà, reminiscent of the underlining amber accord in Obsession*. That amber is even more apparent here than it was in the original, and lingers for several hours. But don't let this prevent you from experiencing the dryout, which holds some surprises, albeit subtle: a woodsy, almost incensey dry down, with hints of vetiver and also a bit of bittersweet coumarin note (but not nearly as much as in the original). "This perfume begins afresh, anew, étincelant: the premier flush of spring. Jasmine and orange blossom wing their way close upon the heels of bergamot and narcissus…the sun is eclipsed by darkness. What was brilliant and glitteringly green is now muted by shadow—slowly at first, then gaining momentum until we are submerged, engulfed in the depths of moss, resin, mood. 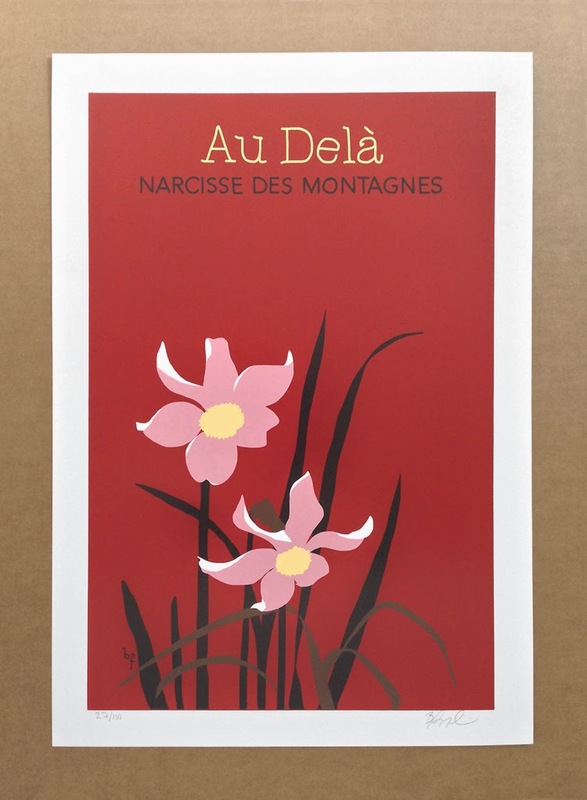 Narcisse des Montagnes has claws: she burrows into your psyche with the intention of taking up residence." * By the way: I have a vintage of the extrait, and it is stunning. You'd be hard pressed to believe it was a designer fragrance, once upon a time, and it is about as dietary as Shalimar ever was. You should absolutely try it! It is its own unique creation though, and much more warm and ambery underneath it all. Also, if you like No. 19 you would enjoy 1000Flowers' Fleur No. 1. BTW - it also happens to have narcissus absolute in it.